Category Archives: "Hoba Meteorite Surrounding"
Guest Farm Ghaub was once considered one of Namibias best kept secrets. Located in the Otavi mountain range 450 Kilometres north of Windhoek near Tsumeb, Ghaub is steeped in history as it was founded as a German Lutheran mission station in 1895. Ghaub was converted into a lodge while retaining much of the original character and design. Today it provides a spacious 10 twin room facility in a beautiful setting. The views from the verandah of each room are stunning and quite unique in this part of Namibia. Guests enjoy the home style cooking on offer and the friendly atmosphere that exists from attentive welcoming staff. The Ghaub cave is of particular interest to enthusiasts and is recognised as a national treasure. With more than 2.5 Kilometres of passageways and corridors it is also popular with day visitors. There is a large working farm attached to the lodge where guests can visit and experience local farming methods and lifestyle. Bird watching is another popular activity and the range and species of birds in the immediate area of the Lodge is regularly commented on by avid bird watchers. A central communal Lodge building with a nearby pool and terrace, and private rustic mountain huts dotted around the area, each with panoramic views over the mountains and the Lodge's waterhole. Wild animals frequently wander into the camp to drink at the waterhole, to investigate the inhabitants, reciprocating their stares, and grazing lazily amongst the trees. You find yourself sitting around a blazing camp fire, sipping a refreshing drink or enjoying a sumptuous meal, and glowing inside and outside. Situated 28km north of Otavi in the heart of the Otavi Mountains, Ohange Lodge is a mountain retreat shaded by large Marula and Tamboti trees, overlooking a landscape as breathtaking as it is peaceful. "Ohange" is derived from the Herero word "peace". The huts are spaced between the shady trees for privacy but linked by paved and lighted footpaths to the central Lodge and swimming pool. 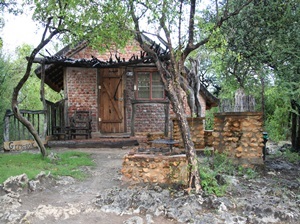 In the character of traditional African huts they are pleasantly cool during the day and warm at night due to their construction of substantial plastered stone walls and thatched roof. The Dornhügel Guest Farm lies 42 km east of Grootfontein, ideally situated on the way to the unspoiled Bushman's Land or to the tropical Caprivi Strip. Also the Etosha Pan, the Hoba Meteorite and many other different places worth a visit are within easy reach. At Dornhügel you stay in 2 Single- or 3 Double en-suite rooms all comfortable and with a beautiful surrounding. The owners can provide additional children's beds when required. 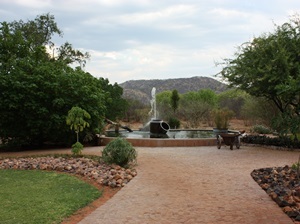 Fiume is owner managed and situated just 30 km north from the town of Grootfontein and 3 km from the B8. Fiume Lodge is an ideal stop over for travellers en-route to the north of Namibia, the Caprivi as well as Botswana and Victoria Falls. 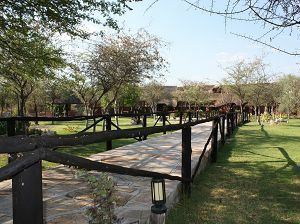 The Lodge’s ideal location also provides easy access to Bushman land, Khaudom National Park and Etosha National Park. The lodge is situated on a 1400 hectare private game farm with more than 10 different big game species and smaller mammal species. Comfortable accommodation is offered in 6 stylish chalets, all equipped with air-conditioning, en-suite bathroom, twin- beds, mosquito nets as well as built-in cupboards to lock valuables for peace of mind. Each chalet is built from stone and topped with thatch with interior designed with rose pine wood to create that cozy “warm” feeling people appreciate when travelling far from home. With Jörn Gressmann (who speaks the language fluently) the lodge offers half day Bushmen activities into Bushmen land and offers a glimpse into the lives of this ancient civilization. Clients can expect the most informal, liberating learning experience about these people, their history, lifestyle and culture. What to look forward to: Bush walk, village life, making of tools, jewellery and weapons. They will teach how to start a fire, how and what to use as medicines and the different roles of men and women in the community. Fiume Bush Camp is an ideal location for those who wish to spend quality time on a Bushman / San excursion in the company of a guide who speaks their language and grew up with the San. It is located 75km north-east of Grootfontein in the Otjozondjupa Region. Highlights include fire lighting, producing bows and arrows, making jewellery and joining in traditional dancing around a fire. A minimum stay of two nights is required at Fiume Bush Camp as this allows ample time to interact with the Bushman community. 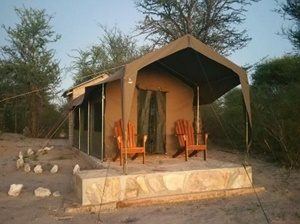 The camp enjoys a sand dune setting, surrounded by Kalahari Desert vegetation and beautiful savannah grasslands. Guests enjoy a full buffet-style breakfast, light lunch and 2 course dinner in the main building. A selection of wines and cool drinks are available. Accommodation is in 8 comfortable safari tents. An en-suite bathroom, twin beds, mosquito nets and locally made furniture are standard. Views of the surrounding environment can be enjoyed from the veranda. The lodge is owner managed by Jörn Gressmann who grew up wiht the San on his fathers farm and speaks their language fluently so translation is perfectly managed. Roy’s Rest Camp is only a small part of the farm Elandslaagte, which consumes a space of 2800ha in total. Roy’s Rest Camp was started in 1995 and was built for Cattle Farming and Tourism as the main industries. Elandslaagte is one of the oldest farms in the district of Grootfontein, and has been here since 1930. It belonged to the Alberts family and originated from the Dorslandtrek. At ideal stop over to Northern Namibia, Caprivi and Bushmanland. There are 5 standard rooms and 2 family rooms all with en-suite facilities and private braai areas. Bungalows are of unique rustic designs and have air-conditioning and mosquito nets. 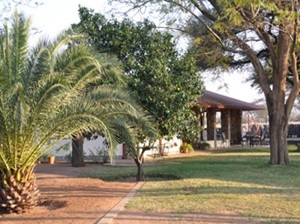 The lodge also offers 12 camp sites with braai facilities and hot water at the ablution block and bush kitchen, within walking distance of the swimming pool and dining area. Also available are walking Trails for bird watching and game watching. You can also visit the Traditional San (bushmen) village about 86km from Roy’s Camp. The Minen Hotel is a well situated garden hotel in the heart of Tsumeb. The hotel is famous around the country for the natural atmosphere, hosting a wild garden, traditional German cuisine and excellent hospitality. All rooms are comfortably furnished with en suite, TV, telephone and air-conditioning. 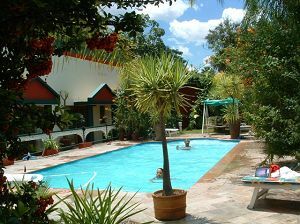 The hotel also boasts luxury suites and a refreshing swimming pool. 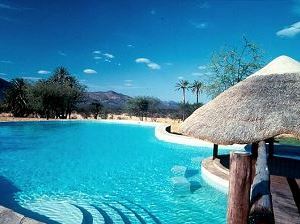 !Uris Safari Lodge is located 20 kilometres west of the town of Tsumeb. Historically there were eight existing houses, which accommodated the mineworkers in the early nineteen hundreds, locally referred to as a "kompong". These houses were revamped and now !Uris Safari Lodge features these cosy houses as comfortable furnished brick and thatch-chalets, each with air-conditioning and en-suite bathroom. 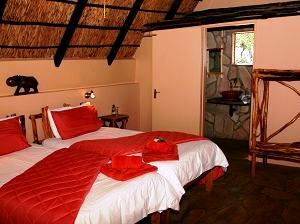 The lodge accommodates a maximum of 42 guests in 14 rooms consisting of seven semi-detached chalets. There are seven queen bedrooms. The other seven family bedrooms are furnished with four three quarter beds, of which two beds are fitted on a loft . Rooms are equipped with mosquito nets, hair dryer, electric kettle, digital safe and telephone facilities. Electric appliances all run on 220/240 volts.